Before you judge me, it gets worse. I wasn't even sobbing over terminal cancer or something equally valid. I was crying because the life that I lead is very small, and sometimes, it makes me feel very small along with it. When I was young, I had big ambitions for serving God, and incredibly not one of them included scraping crusty noodles off the dining room floor. I imagined myself going on mission trips with my husband, authoring books, teaching children, serving the poor. Sure, I do variations of those things now, but do you know what I do ninety percent of the time? Laundry. It grows like Strega Nona's spaghetti in our home. Oh, and grocery shopping! I'm convinced that our pantry is the doorway to a parallel universe, because the moment I fill it, everything disappears again. Last night I looked at the week ahead and realized I wasn't excited about anything I had to accomplish. As a matter of fact, I was the opposite of excited. Deflated. Weary. Discouraged. Through my tears, I told God, "I don't want to serve You this way! Please, let me do something bigger! Let me do something better." And whatever you do, whether in word or deed, do everything in the name of the Lord Jesus, giving thanks to God the Father through him. I imagined myself holding out a Christmas gift to God, only it wasn't the present He wanted. It was the present I wanted to give Him, like buying your husband a weed wacker when he asked for golf clubs. Really, it was a gift for myself. Let me honor You by becoming a world-famous author! How about that? Let me do something big and impressive in my church. Let me put this college degree to use . . . You will be so glorified, I promise! But God wasn't opening any doors for me to become a world-famous author, or a world-famous anything. Instead, He was pointing me back to the opportunities that sat right in front of me—opportunities to love and serve a family that needs to eat and play and wear clean clothes, and occasionally even bathe. The truth is sometimes I really love "whatever I'm doing," and sometimes I really hate it. Isn't that life in every season? There are parts we relish, parts we tolerate, and parts we despise. Parts that make us laugh and parts that make us cry and parts that make the veins in our forehead pop out. And yet through all of it, God urges, "Whatever you do . . . do it in MY name! Do it for MY glory! Do it to serve Me." Verses 23–24 actually go on to promise that we will receive a reward when we work with our whole hearts as unto the Lord. Do you realize what that means? It means there is value in the most menial corners of our lives. It means we have purpose, always. We have the opportunity to worship, always. I meditated on these verses all day long, as I scrubbed dishes and cleaned countertops. I thought about Jesus as I checked homework and brushed hair and swept floors and packed lunch boxes. And right around the time I was pulling that little lint trap out of the dryer, I felt it. Overwhelming gratitude. There is value in the most menial corners of our lives. 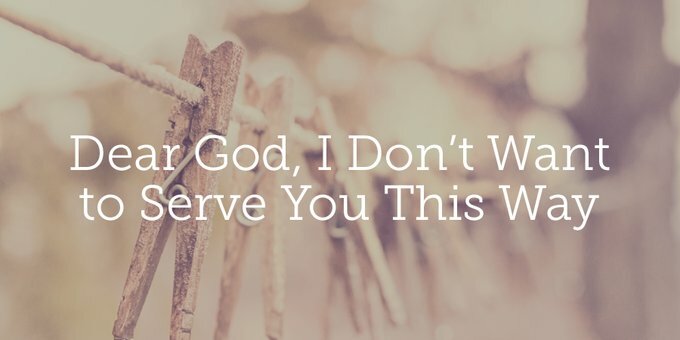 I paused with a huge ball of lint in my fist, and I told God, "I don't deserve to serve You. I don't deserve to be part of Your work or to stand in Your presence and offer You any gift at all!" In my stale little laundry room, I felt the staggering weight of God's generosity—that He would allow me to be part of His story, that He would redeem the most insignificant moments of my day, that He would stoop down to take a gift out of my dirty hands. Standing in my laundry room, I realized that I serve a God so generous that He's willing to make ordinary moments sacred. He's willing to commune with me in the humdrum of everyday life. He's willing to credit my faithful folding of underwear as service to Himself. Doesn't that just blow your mind? It blows mine! I serve a God so generous that He's willing to make ordinary moments sacred. He's willing to commune with me in the humdrum of everyday life. I wonder, today, what is the "whatever" that you have to do? Is it menial chores, like me? Is it taking care of someone sick? Is it praying (again) for a child who is breaking your heart? Is it going to another day of work? Or marriage counseling? Is it something you can't wait to do or something you've been dreading all week? Whatever you do . . . you have the opportunity to worship Jesus today. So today, "Whatever you do, work heartily, as for the Lord and not for men, knowing that from the Lord you will receive the inheritance as your reward. You are serving the Lord Christ" (Col. 3:23–24). Dear friend, it is the Lord Christ you are serving. Jeanne Harrison grew up as a missionary kid in the Philippines. Today, a frequent blogger and author, Jeanne is passionate about sharing her experiences and wisdom with potential world changers. She lives with her husband Clint and their four daughters in Macon, Georgia, where Clint serves as an executive pastor at a local church. When she’s not writing or changing diapers, Jeanne loves to teach, drink coffee on the back deck with Clint, and play a fierce game of ping pong!